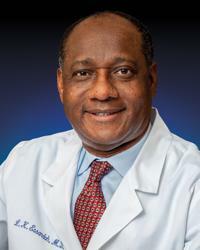 Louis K. Essandoh, MD is a board certified cardiologist. His interests include preventative, consultative and nuclear cardiology, exercise physiology, and clinical trials. His primary focus is coronary heart disease, valvular heart disease and cardiovascular pharmacology. Dr. Essandoh strives to involve patients in their care so that they share in all major decisions. He believes that intently listening to his patients makes their diagnoses become evident. He presents an unbiased assessment, allowing patients to decide their own therapy after becoming well-informed and educated on their condition.